Only a transfer ban stopped Atletico Madrid from selling French forward, Antoine Griezmann to Manchester United. The 26-year-old had grown disillusioned with life at the Madrid based outfit, and was keen on a move to Old Trafford to join up with international teammate and friend, Paul Pogba. A deal fell through with the star choosing to stay out of loyalty to the club, given that they wouldn’t have been able to secure a replacement in the summer transfer window. This season has seen him struggle to reach the heights expected of a player of his reputation, leading to speculation as to whether his heart is still at the club, or that his head has been turned by interest from other clubs around the continent. He is on course for his worst goalscoring season with the Rojiblancos, as he has netted just 11 times in what has been an underwhelming personal campaign for the former Real Sociedad man. Despite the arrival of former Arsenal star, Alexis Sanchez, having a player like Griezmann will be nothing short of remarkable as we would strike fear into the hearts of defenders with such a potent double attacking force. 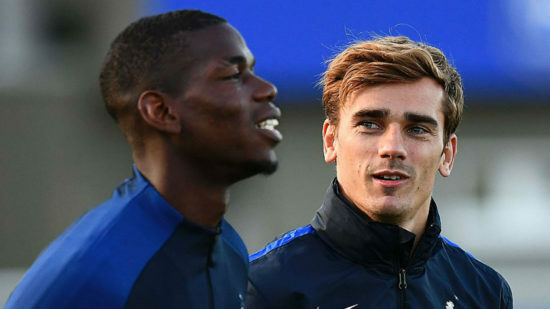 Mourinho has been keen on working with Griezmann, as he wants another left footed forward to add more dimension to the attack. His favoured no 7 has been taken by Sanchez, but a bigger slice may be on the cards. Zlatan, who currently wears no. 10, is expected to leave at the end of the season. Manchester City and their band of attacking players have blown everybody away with their attacking power this term, but we can make a statement next term with the acquisition of Griezmann, who looks tired of the lack of trophies his club boast at the moment. Griezmann, Martial, Sanchez and Lukaku will take some stopping and Jose must make that dream come true.